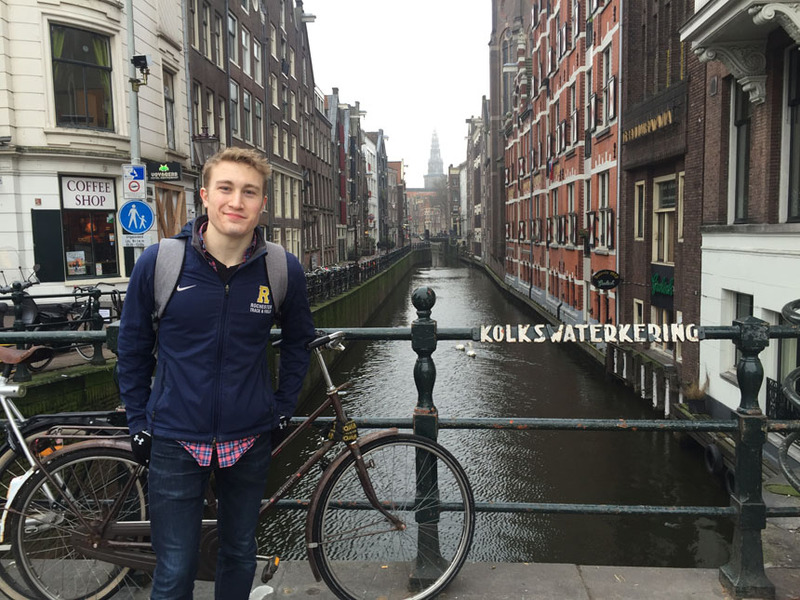 Nathan Contino in Amsterdam, one of many cities he visited while studying abroad at the University of Bristol during fall semester 2016. 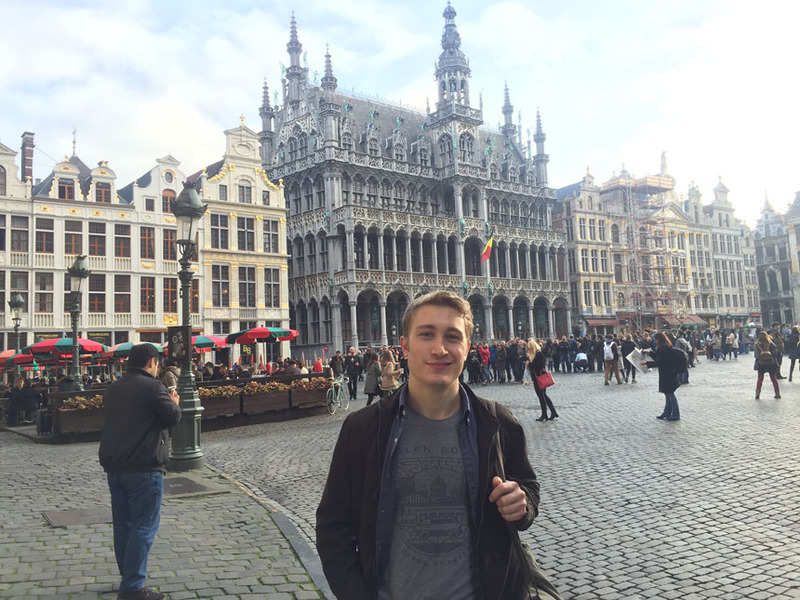 All his life, Nathan Contino ’17 has read stories set in major European cities such as London, Paris, Amsterdam, and Geneva. A study abroad semester at University of Bristol last fall allowed the dual major in computer science and English to visit those cities in person. He and a friend had just arrived in the city after a delayed flight. They had survived “the initial shock of the French language barrier on the Metro,” and despite their hunger pangs from missing dinner, they set off for the Eiffel Tower 20 minutes away. Nathan’s study abroad experience was satisfying in other ways as well. • He took three classes that count towards his English major, and audited two other computer science classes. He especially appreciated the support he received while planning his trip from the University’s Center for Education Abroad office and from his advisors in the computer science and English departments. The only stress was having to wait until late May/early June to learn if Bristol accepted him, then having to change his course schedule after he arrived. “However, once I learned how the whole system worked, my classes ended up being fantastic and everything went smoothly from there,” he says. “But I think the most important thing I learned was just how much I don’t fully appreciate a lot of the things we have in Rochester,” he adds. “A lot of students joke about how Rochester is a small city that’s not really significant, and how we’re not-quite-Ivy League, but I have to say: I see more passion, more dedication, and more of a spirit of cooperation here at Rochester than I’ve seen anywhere else. We really have an amazing student body, and as much as I loved all of the beautiful cities, interesting classes, and wonderful people I met while I was studying abroad, I realized that Rochester really was the right choice for me. His advice for other students thinking about studying abroad: “Everyone is going to tell you about all of the amazing things that you should do and see and how life changing all of these things will be. While that’s true (to an extent), study abroad is really learning about what you like: do you enjoy going to clubs in a different city every weekend? You can do that. Or maybe you prefer traveling to a new city with a good friend and trying out all of the local cafes instead of doing a bar crawl. Maybe you just like spending the entire day in museums. Or maybe you like all of that. Try a bit of everything to see what you care about the most. Make it your own experience and you’ll truly grow to appreciate what you value in life." 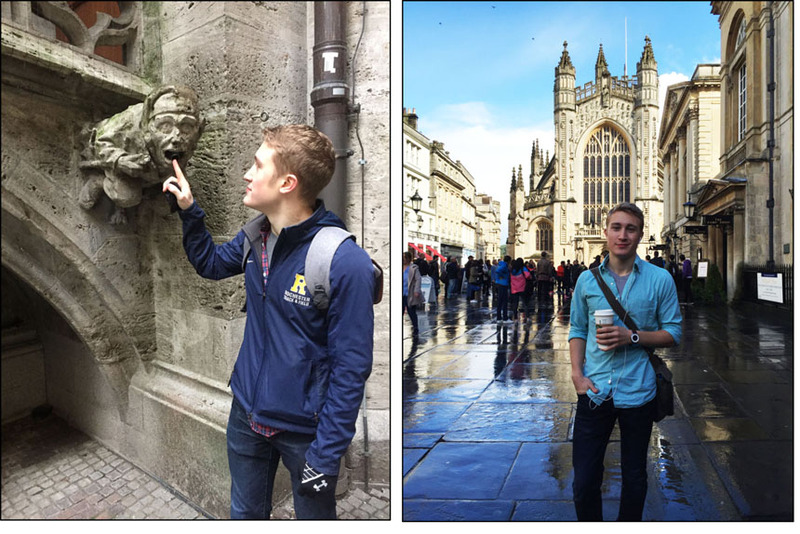 Nathan in Munich (left), Bath, and Brussels (below).